Who the composer of this Divertissment was is unclear. Grove lists an (Ivar) Henning Mankell, a Swedish composer, who was born in 1868 and died in 1930. 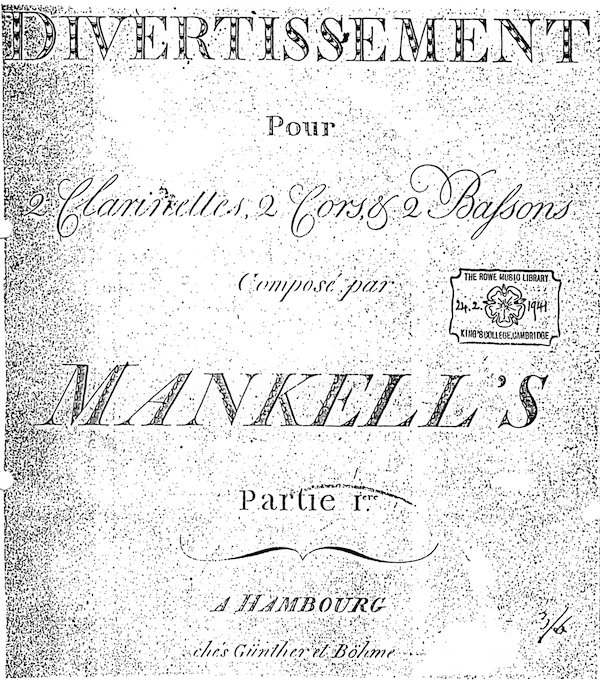 It is unlikely that he was the composer as the Divertissement is in a typical Harmoniemusik form, which, unless it was written as a pastiche or for a special commission, was a form abandoned by the early 19th Century. The title page seems to suggest an edition prior to 1850 and possibly even earlier. The actual music engraving (a mixture of moveable type and hand additions) would imply a date of late 19th Century; so it is difficult to judge a date for the original except one based on the style of the music. Another candidate who fits the earlier date is Johann Herman Mankell (1763–1835) who was born in Niederasphe in Germany and was the great-grandfather of Ivar Henning Mankell. He spent the first part of his life in Denmark, where he is recorded as being part of the Moravian community in Christiansfeld, for whom he was an organist and music teacher. While there he composed instrumental and choral music, coming to the notice of King Gustav IV after having composed a March when the latter visited the congregation. After some controversy over his secular music he moved to Sweden where he spent the rest of his life. 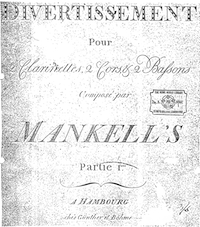 How likely that Johann Herman was the composer of this sextet is unclear, and, until more accurate information is obtained, caution must be exercised about who the composer was.